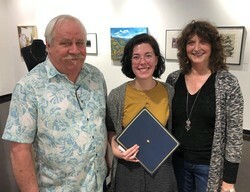 David Cozadd, president of the SFA Friends of the Visual Arts board, and Linda Mock, FVA scholarship committee chair, present the Charles D. Jones Art Scholarship to Sarah Jentsch, senior printmaking student from Etoile. NACOGDOCHES, Texas - Sarah Jentsch has been selected as this year's Charles D. Jones Art Scholarship recipient at Stephen F. Austin State University. Jentsch, a senior from Etoile, is studying printmaking in SFA's School of Art. Neal Cox, associate professor/printmaking coordinator, nominated Jentsch for the scholarship. She has been a student in several of Cox's classes during the past two years. "In all cases, she has excelled and has established herself as a leader in the printmaking studio," Cox wrote in his nomination letter. "I have been thoroughly impressed by her ability to learn readily, her positive attitude, her broad knowledge base and her social aptitude." Cox said that printmaking is not an easy discipline by way of technique and workload, explaining that it can be intimidating to even the most talented students. He said Jentsch possesses qualities that help her carry her talent through to successful learning. "She knows how to pay attention, takes accurate, extensive notes, and later reviews and revises her notes," he said. "Her attentiveness, her enthusiasm for learning, and her natural ability all help her acquire information quickly and effectively. "Ms. Jentsch possesses a delightful sense of humor that helps her laugh with others and sets them at ease," he said. "She comes to class with a smile and engages her fellow students, helping them to feel at ease and to learn along side her. She seems to believe that she can learn despite any apparent obstacle." The SFA Friends of the Visual Arts has established scholarships in the name of retiring art professors who were employed in the School of Art for a minimum of 10 years before retirement and who contributed in a significant way to the mission of the FVA board and its fundraising activities, such as consistently donating art for fundraisers, by providing monetary assistance, or by serving on FVA committees or board. The Jones scholarship is awarded on an annual basis to a junior, senior or graduate level student with drawing or printmaking as his/her major study area. Students must show initiative and a broad appreciation of all of the fine arts with a concentration on printmaking, according to the eligibility criteria established by Jones. Jones is professor emeritus in the SFA School of Art where he taught printmaking, drawing, Mexican art history and the "Art of The Book" from 1971 to 2011. During that time, he was named a Regents Professor and received a Distinguished Professor Award from the Alumni Association and a Teaching Excellence Award from the university.